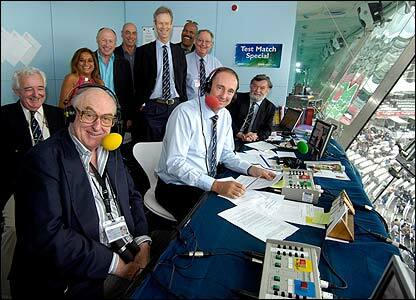 The return of the Ashes means the return of Test Match Special, the BBC’s informed but irreverent commentary team of “Aggers“, “Blowers” & Co, that leaves you wondering about Mandira Bedi and other corruptions that have become par for the course in Indian cricket commentary in the name of the lowest common denominator. Besides the words, the TMS team is best known for the cakes, and the riotous laughter that the unintended gaffes like “the batsman’s Holding, the bowler’s Willey” induce. Brian Johnston’s giggling fit—sparked by Jonathan Agnew’s quip that Ian Botham “couldn’t quite get his leg over” after Botham had dislodged the bails with his inner thigh—was voted Britain’s favourite piece of sporting commentary of all time. A recent gem involves the mercurial left-arm spinner Phil Tufnell. Who killed (good) cricket writing? This entry was posted in Cricket, Etcetera, Tongue In Cheek and tagged BBC, Brian Johnston, Christopher Martin-Jenkins, Churumuri, Henry Blofeld, Jonathan Agnew, Mandira Bedi, Michael Holding, Peter Willey, Sans Serif, Test Match Special, The Ashes, TMS. Bookmark the permalink. ← Mirror, mirror on wall. Who’s fairest of them all? Oh my god! gone are those days of Sushil Doshi and Narottam Puri. What a laugh riot their commentary induced. Test matches were so much fun. Listening to radio in school! Will the future generations ever know of the likes of Ritchie Benaud and Henry Bloefeld?? I consider myself lucky to have lived in this generation! I am one of those persons who relish cricket running commnetary for that matter.i do tune to radio Australia,New Zealand and TMS for their commentaries.Things have changed the way commenatators use the words to describe but still they are fun.Anyaway not many takers for radio commentary.But I hate AIR these days cos i will be listening only to commercials.Also their team still has Suresh Sarayya,Major Nargolkar who time again speak about the glorious days of Gupte,Bedi,Gavaskar.No new talent search nor its lucrative for youngsters in AIR.Tune to TSM. Thank you and yes, it is indeed sad that cricket commentary today is driven by legs that cross over for the camera, lips and looks that sizzle the cherry, and wooing heads with furniture between the ears. The Guardian OBO (Over-By-Over) is good too. Cricket commentary nowadays is very drab. But we have to make good with the same listless voices of our own commentators and from our lovely neighbours. Even overseas tours are devoid of good commentary. Apart from Gavaskar and Akram (his English not so good) no one else talks about the technical aspects. We often hear Gavaskar giving so many tips on batting while Akram has been good talking about fast bowling. The only change we get in this team is Alan Wilkins at times. Being eloquent, Harsha is good to hear. Commentary hits its lowest ebb especially if it is SONY with cricket being compromised for all other stupid stuff. TV commentary and presentations during the recent IPL was horrendous. I know lot of good names have been missed out above, while I feel there is no need to mention the not so good ones. i for one didnot get what getting leg over means and hence completely missed the joke. i assume it means could not really consumate complete with all that it insuniates. i can see how it could be funny but it didnot make me laff. english is their language and they know how to wield it and be funny in it. just like manikanth yadav of bbc can split your seams by his use of hindi and native metaphors. we have to use mandira bedi only bcoz we are unfunny in english. but more seriously, what is ironic about this whole post is that churumuri expects us all to be padded up on english phrases like getting leg over and laff at a stupid joke like feng shua and simulataneously makes fun of some small town guy’s copy of child bear(written exactly the way we pronounce it chi-l-D bee-yar = chilled beer, chylD/ chailD baer would how we would have written child bear). i known it is fashionable in our circles to kayyi mayyi parchkofy brahminical distaste for apabrahmsa. but prey tell me how are these posts on churumuri, which are really copies of “know your english” different from that? atleast the original is brahminically somber and scholarly about it. remember when churumuri started voice-casting? instead of speaking to us, churumuri was reading written english. this is churumuri, who has some facility in writing english and is undisputedly witty in writing funny english. more importantly, people who represent our commentary and think mandira bedi can make up for all other defiencies are all product of modern english schooling, most of them from reputed conments i bet. what does it say? what does it say when we cant be natural and thus eloquent in describing ankhon-dekha-haal – describing things as we see it, – kanDaddu kanDang heLoke bardiddre, baayi, kaNNu iddu yaen upyoga? Feng Shui! That explains the weird colours that these teams are wearing now a days. Look at the BBC cricket team photo. There used to be a time during the initial days of Doordarshan telecasts, when they had roped in radio commentators to do the commentaries. One could completely ignore the videocast and still not miss much. Given the bad visual quality it was better for the eyes anyway. Things have surely come a long way since then.